… out-of-state companies that want to export more and more gas to China,” said Wes Gillingham, program director of Catskill Mountainkeeper. 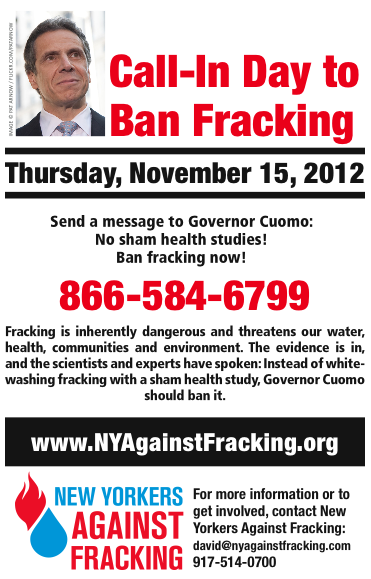 Fracking Update: Where Are We In Our Fight to Stop Fracking in New York? New York State Health Commissioner Nirav Shah has named three highly qualified medical experts to assist him in the state’s internal review of the health impacts of hydraulic fracturing. They are John Adgate, chairman of the Environmental and Occupational Health Department at the Colorado School of Public Health; Lynn Goldman, dean of George Washington University’s School of Public Health and Health Services; and Richard Jackson, chairman of the Department of Environmental Health Sciences at the UCLA Fielding School of Public Health. This follows Governor Cuomo’s announcement in October that he was asking for further review of the information that the State has prepared on the health impact of fracking. Although the caliber of the experts that have been selected for this task is very high, there are still major problems with this process. These experts will only be looking at the documentation that has been previously been prepared by the Department of Environmental Conservation (DEC). No one outside of the government has seen the information that these experts will be reviewing. There is no transparency – the medical community and the public are being left out of the process. It is unclear whether these three experts will have the independence and autonomy they need and deserve to do the job right. As we said when this was announced, we agree that a review of the health impacts of fracking is critical but the process that is being implemented is very inadequate to protect the public health. The only type of health review that would be sufficient is a comprehensive and rigorous independent Health Impact Assessment (HIA), which distinguishes itself from other kinds of public health investigations by using quantitative, qualitative and participatory techniques. A deadline is looming on November 29th – the date when the state is supposed to have completed its process and issued final regulations on fracking. This date now appears to be virtually impossible for the DEC to meet, which would open the process to additional public input. Catskill Mountainkeeper will keep you informed about what develops and continue to pressure the Governor to order an independent HIA. Please click the link below to send Governor Cuomo an email. As we head toward the November 6 election, you can’t miss the vitriol boiling over in public debate. Best to shrink government and then drown it in a bathtub, say anti-tax crusaders. The implications for our water systems are hard to miss. Throwing out that bath water would mean under-investing in infrastructure, losing out on essential financing, compromising public health regulations and discharging public servants charged with keeping our water supply and watersheds healthy. Post-Sandy, New York City is awash with problems, but in most cases drinking water quality is not one of them. 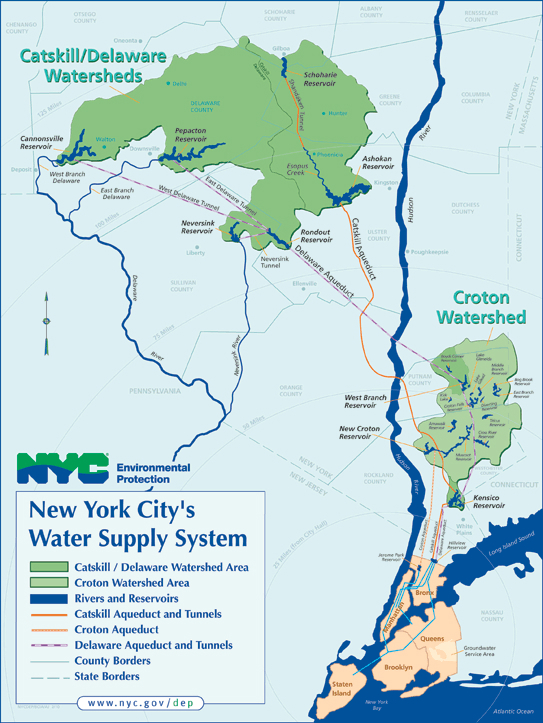 “The genius of the New York City water supply is that we have ample reservoirs located away from the city that are not groundwater based,” says Dan Kass, the deputy commissioner for environmental health at the New York City Department of Health and Mental Hygiene. The anti-government activists suggest privatizing water. But that’s been tried many places from Atlanta to Bolivia, often with disastrous results. In fact, Paris, France is leading a new counter-trend towards remunicipalizing its water services. Thus, when Appleton became Commissioner of the New York City Department of Environmental Protection and Director of the New York City Water and Sewer system in early 1990, determining if there was any alternative to this was at the top of a very crowded agenda. However, unlike nearly the entire American water industry and its regulators, both of which were dominated by civil and public health engineers who thought almost exclusively in facility construction terms to solve water quality problems, Appleton’s background was in management reform, public finance and environmental policy, particularly land use. He and his new management team were quickly convinced that allowing Catskill drinking water purity to deteriorate and then spending massive sums to clean it up was not the ideal option. The team’s philosophy was that a good environment will produce good water. And that made investing in the environment a smart and profitable investment for New York City. Operationally, the question became what environmental investments should the city make. Some, such as adding to the publicly held land in the watershed — particularly critical lands threatened by development — along with stream corridor restorations and better stewardship of city owned lands were obvious. But that did not answer how to control non-point source pollution on privately held farmlands and other rural landscapes. The city began to organize an unprecedented program of regulatory enforcement against non-point source pollution runoffs in its watersheds. Some farmers and other rural landowners reacted angrily. 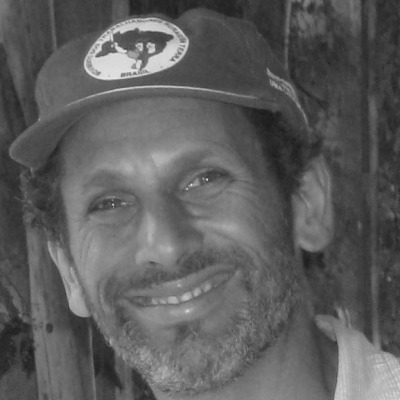 But with the city’s support, the Catskill farmers created a program they called “Whole Farm Planning,” a title designed to capture the fact that it incorporated environmental planning into the business strategy of the farm — a pollution control plan was developed for each farm, by the farmer and local farm and agricultural experts. The New York City example offers revealing lessons about how to preserve the integrity of our water systems in the age of superstorms. Investments in innovative public water systems are a top priority, not their abandonment. Consider your next glass of drinking water – and where it comes from — when you vote this Tuesday. Water citizenship means exercising your right to vote for safe water. Who knew more than five years ago that fracking for natural gas would become such a hot-button national issue that politicians from President Barack Obama to Republican challenger Mitt Romney and virtually every local candidate for Congress would have to take a stand? After all, back then, fracking — the horizontal natural gas extraction method of hydraulic fracturing — was only a hot topic in places like Sullivan County that sit on the gas-rich Marcellus shale.